There's no denying that mobile is the new digital benchmark and trendsetter for brands across the board. Most companies, whether they be large corporations or small startups, are incorporating mobile apps into their business strategy. We talk a lot about entrepreneurship and skill learning on this blog, and have even prepared tutorials for mobile app development. But before developing a mobile app, there are a few questions that you should ask yourself. More than 60 percent of Americans own smartphones and global tablet ownership will reach 905 million by 2017. With such a multitude of choices, device fragmentation is a major challenge for mobile projects. Analyzing existing traffic to a company website will help with assessing an audience in terms of device preference. If a majority of shoppers access a site from Android phones, the mobile app in question should be built on Android. Another point to consider is that iPhone and iPad users are likely to spend more than Android users. Despite Android representing a substantial market share, Apple users pack a statistically larger transactional punch. Also keep in mind that tablet users of all types boast more transactions than smartphones. 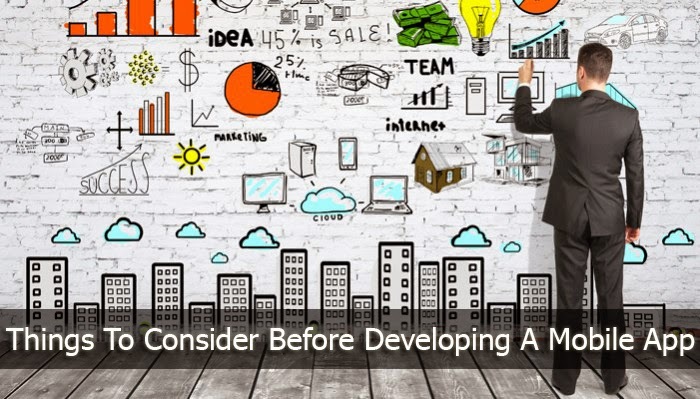 Once a business identifies the ideal development process and platform, the team can begin contemplating functionality. Whether it be mobile shopping or filing expense reports, a centralized focus is key. Will the app be a comprehensive 'kitchen sink' for customers, meaning they can interact in every way with a brand, similar to a website? Another approach centers on simplicity. Amazon's mobile app, for instance, is streamlined for 'Buy It Now' transactions rather than for reading reviews, selling used products or customer service. The same approach is effective when building internal business apps. Rather than create one app to handle document authorization, expense reporting and sick leave requests, it can be more efficient to create isolated apps that integrate when needed. Businesses must know what their mobile user base wants to accomplish. One way to assess the objective is to analyze the top actions taken by mobile visitors browsing the existing website. Another important aspect to keep in mind when developing a mobile app is the need for integration with backend systems and pre-existing infrastructure. If a brand is building a mobile ecommerce app, due diligence in regards to melding with an ecommerce system is crucial. Businesses must consider the capacity of existing systems to handle additional transactions and traffic. Will Design Be a Priority? At this point in the planning process, decisions about platforms, device type, development language and functionality requirements should be set in stone. One of the final aspects for creating a value-generating mobile app rests with end-user experience and aesthetic design. Average smartphone users download a rotating roster of around 25 apps. With hundreds of thousands of apps competing for space on customer smartphones, an app must stand out in all regards. For apps in today's market, design has become central to popularity and effectiveness. Intuitive interface controls and elegant transitions are mandatory. When any two apps accomplish a similar task or function, the lone differentiator rests with visual design and user experience. On top of the visual and interactive experience for the mobile app, additional aspects such as the app's performance, data consumption and storage size are crucial. By taking a methodical approach towards conception, setting objectives and actual production and development, businesses can take the mystery out of identifying a successful mobile strategy -- at least for the most part.